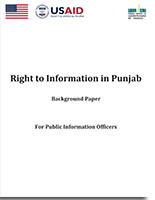 Right To Information In Punjab : Background Paper For PIOs briefs that Citizens’ access to public related information and services in a transparent, accountable, effective and efficient way is of paramount importance for vibrant democratic governance. This has been a challenge in Pakistan due to both legal and administrative issues as well as lack of effective utilisation of their right to information by citizens. The challenge is greater in remotely located rural and peri-urban areas both due to administrative hiccups as well as lack of awareness.